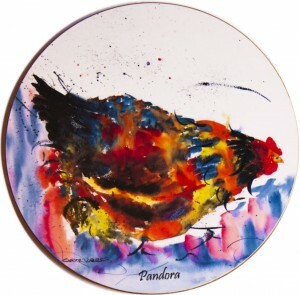 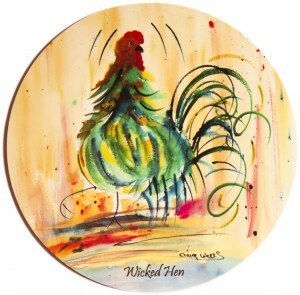 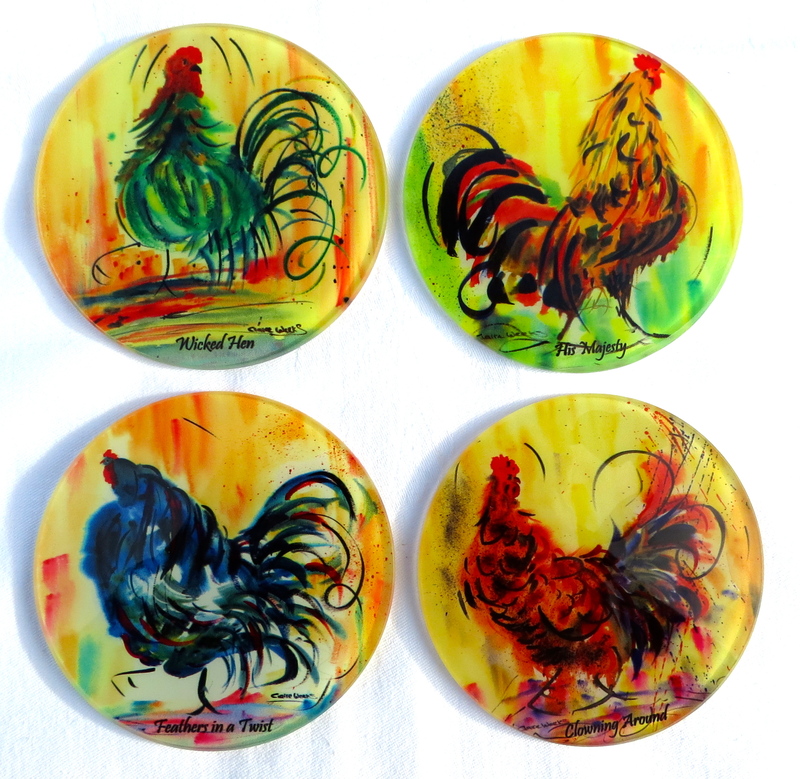 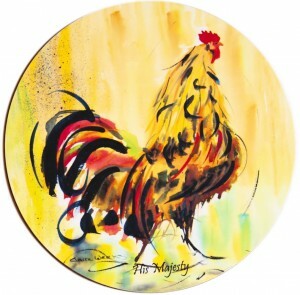 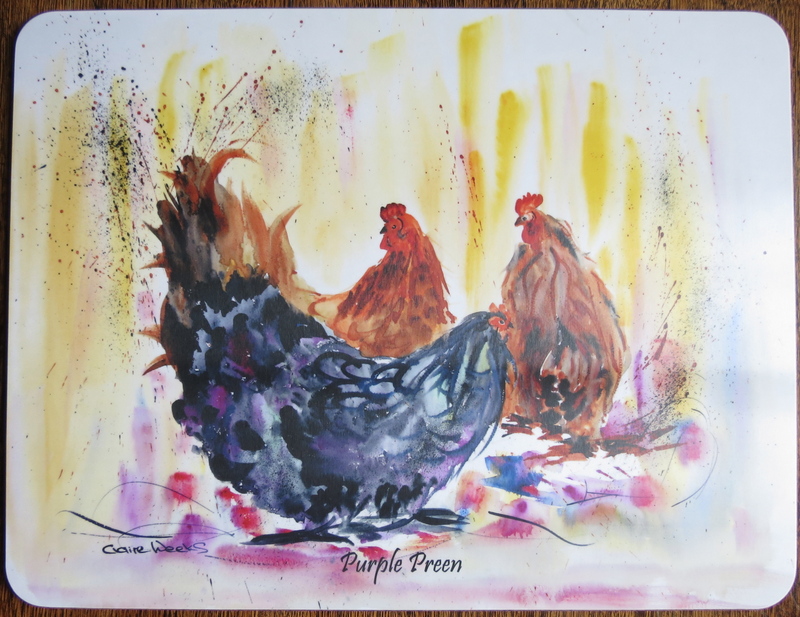 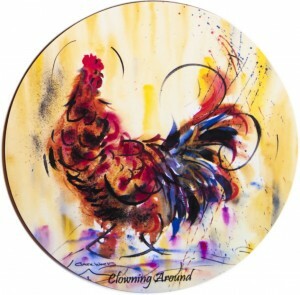 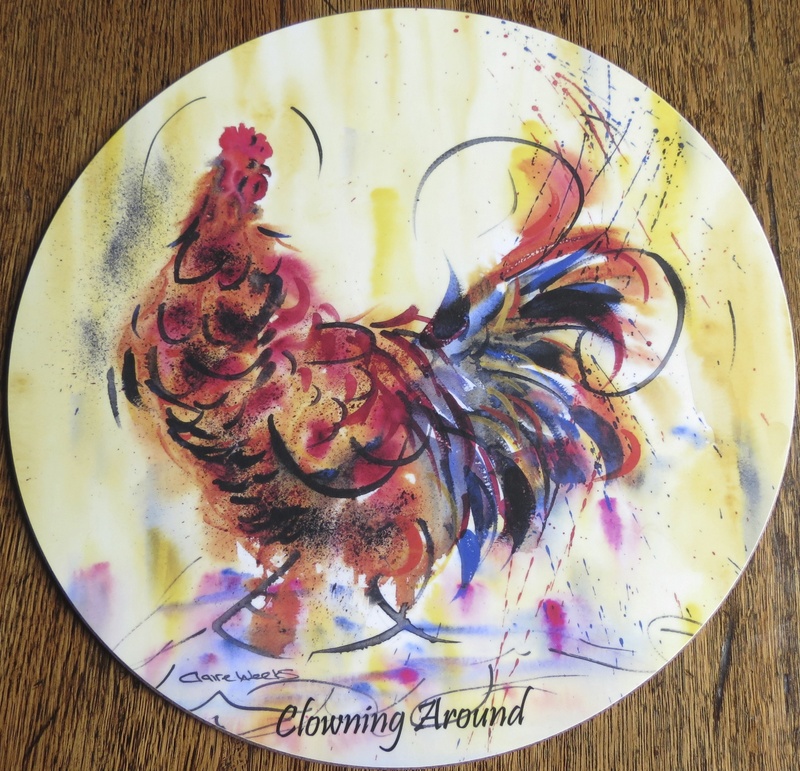 The images portrayed in Claire Weeks’ cheerful and entertaining hen, chicken and cockerel paintings are now available in a range of quality kitchenware animal placemats and animal coasters. 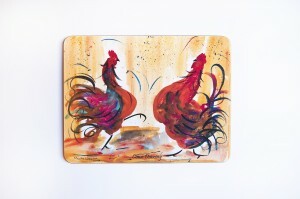 Made in Britain to the very best quality, these tablemats will last many years. 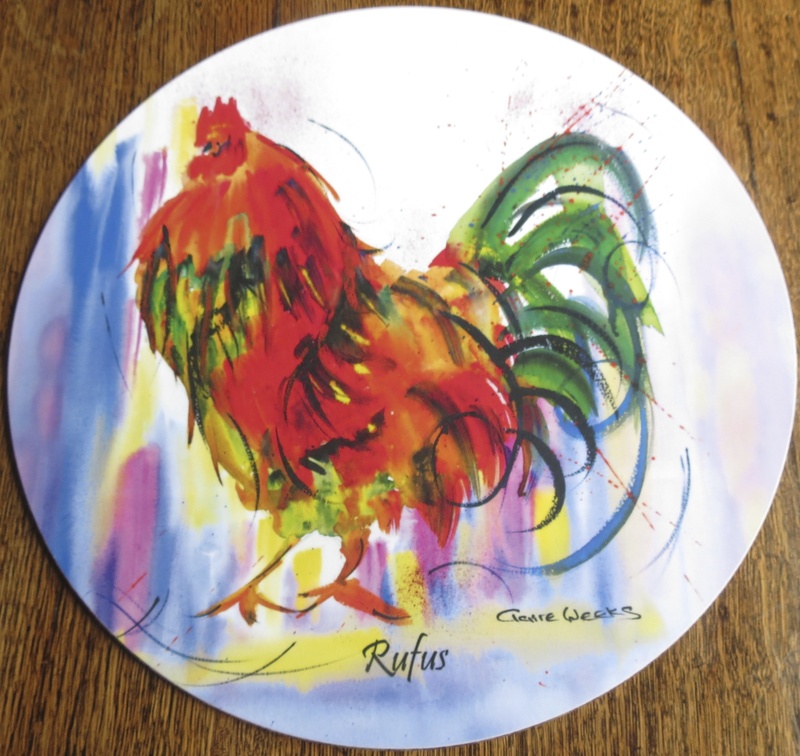 The range of melamine round tablemats are cork backed and measure 11”/28 cm or 10”/25.5 cm diameter and 0.6 cm thick, there are 8 different placemats in the set, all with a characteristic name. Sold in shrink wrapped packs of 4 called Pack A and Pack B. 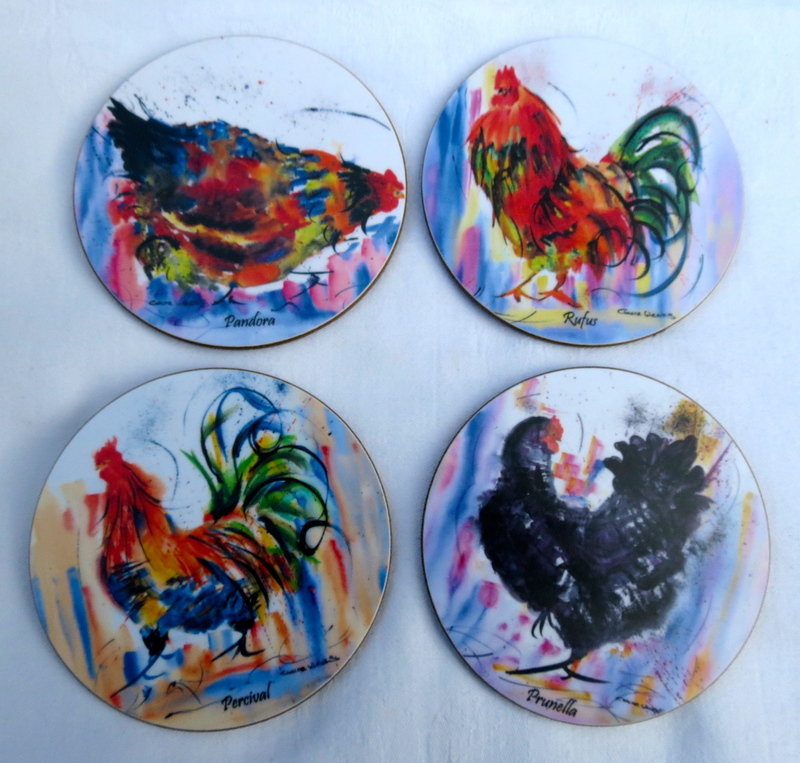 There is a complementary range of melamine coasters measuring 4”/10cm diameter priced at £14 for a set of 4. 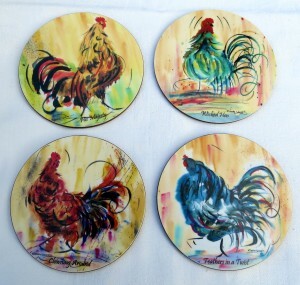 The same coasters are available in glass priced at £20 for a set of 4. 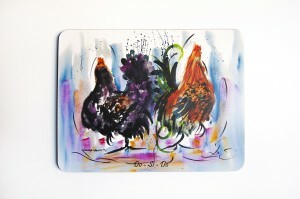 There is a choice of 4 melamine serving mats to choose from priced at £14.00 each. All Tablemats, coasters and serving mats are melamine which is extremely durable and able to withstand temperatures of up to 165c backed in hard wearing cork, they are the thickest at 0.6 cm, and easily wiped clean. 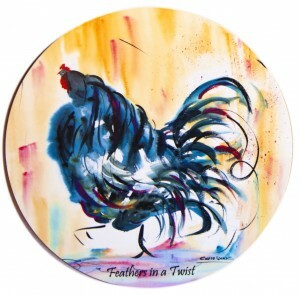 Made in Britain to the very highest quality. 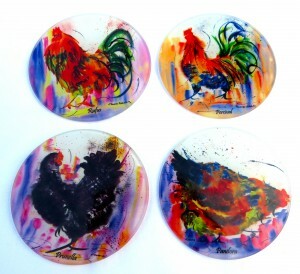 Round glass coasters, Using recycled glass made in Britain, able to withstand temperatures of up to 260 degrees. Details: round melamine surfaced cork backed thick heat resistant coasters. 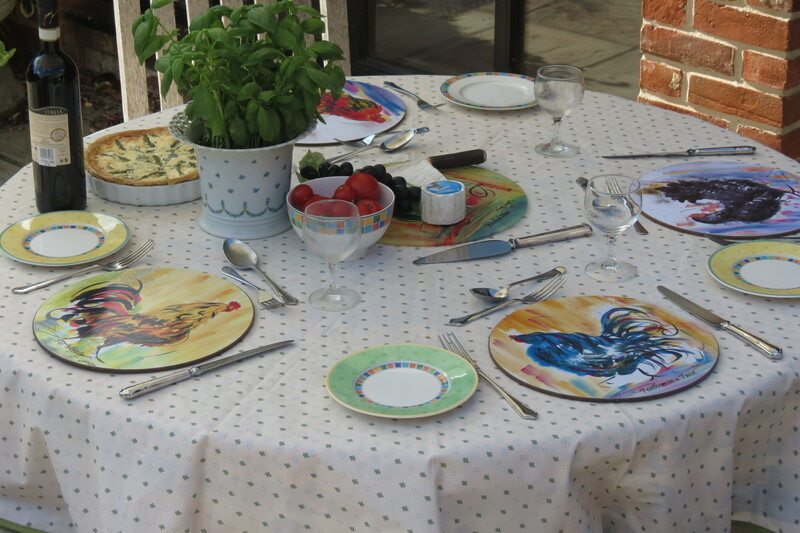 Made in Britain to the very highest quality. 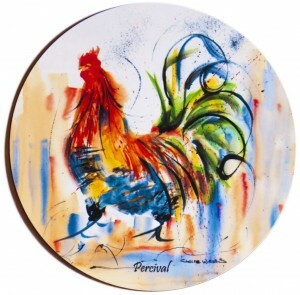 10cm in diameter. 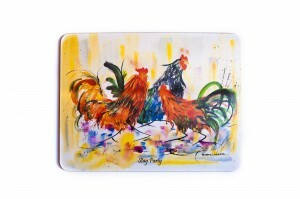 Available in the same designs as our table mats. 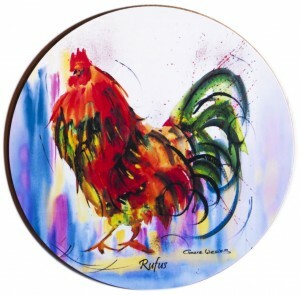 Rufus: Slow and proud, lovely red and greens, Rufus means red in latin. 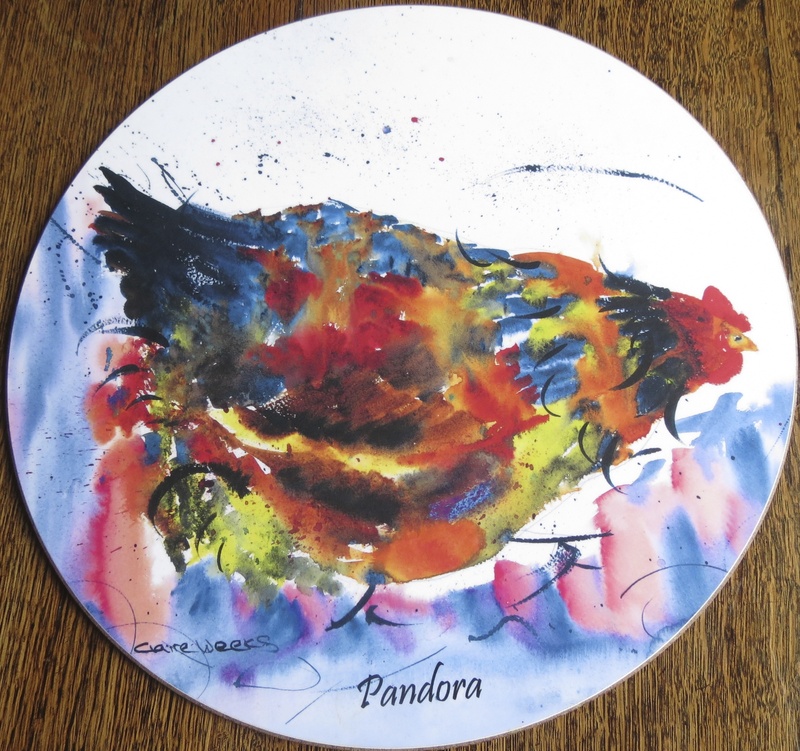 Pandora: Always pecking at something, a lovely burnt sienna, crimson and blue. 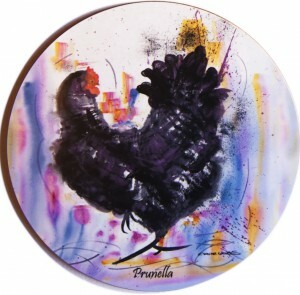 Prunella: Lovely friendly inquisitive hen in blacks and purple. 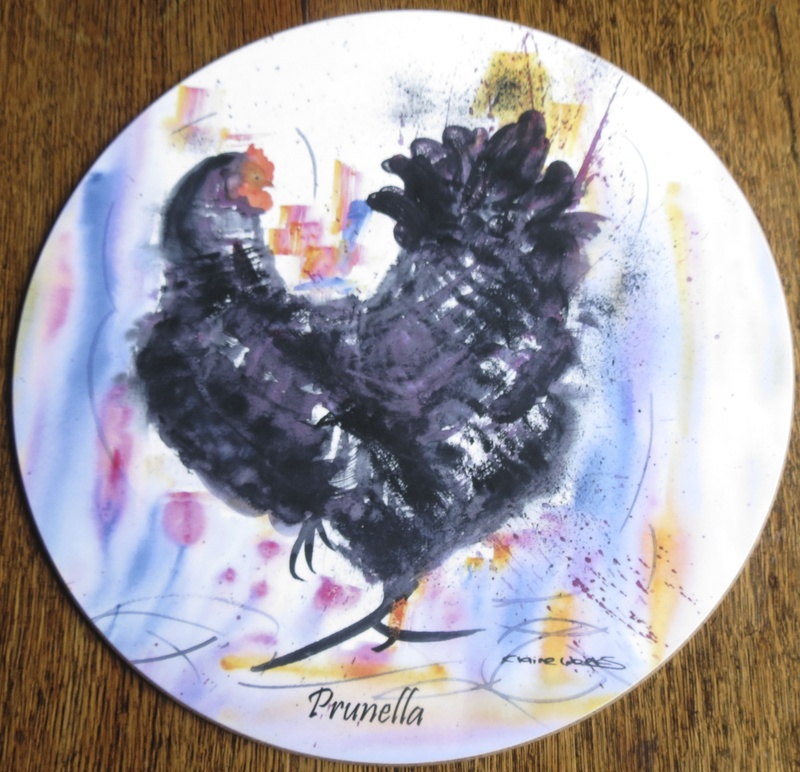 Melamine heat resistant to 165C. Cork backed, made in Britain to the very highest quality. They are 0.6cm thick. 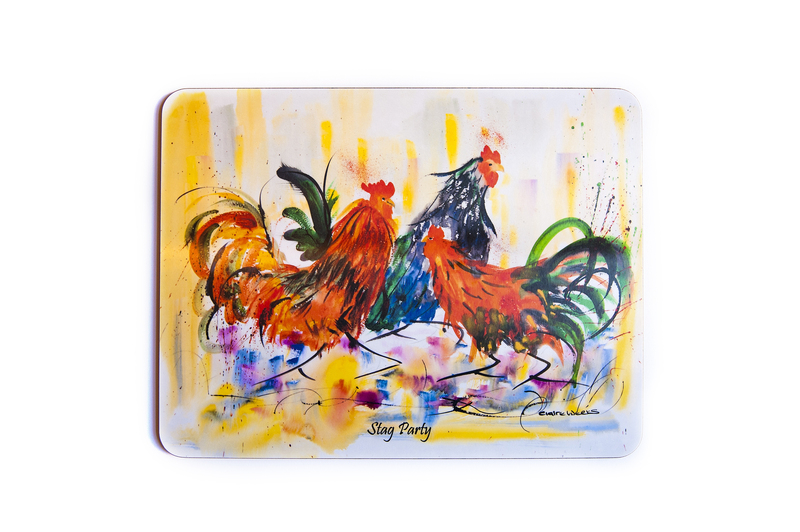 Ideal for hot dishes.